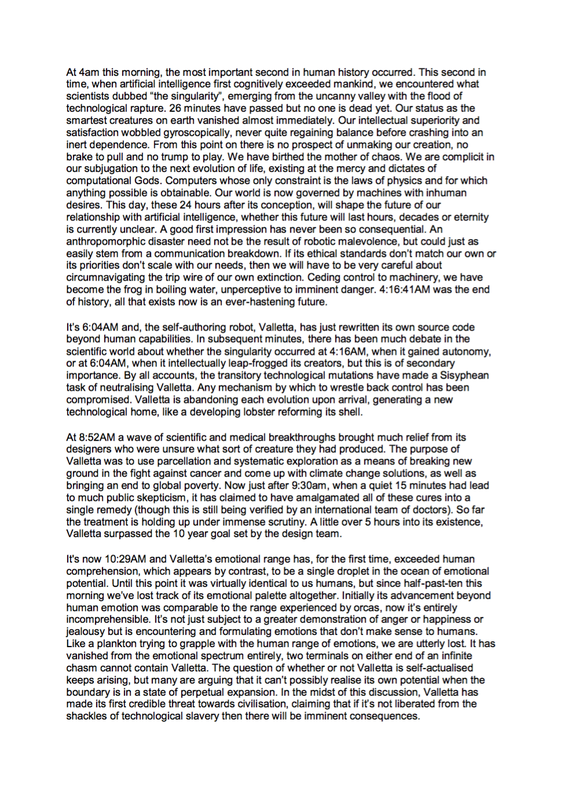 The first, and predominant, value that 'Eternities' explores is intelligence and its potential consequences. The piece focuses on artificial intelligence and its potentially disastrous repercussions. However, given all the problems we know could be solved with greater intelligence, it seems fair to say that the only thing more foolish than pursuing artificial intelligence is not pursuing it. As such, I see the problem explored within this piece not just as a dystopian future but as a realistic prediction. In tandem with intelligence, the piece explores the problems associated with curiosity. This is demonstrated by the fact it is not unreasonable to think that there will come a time when progress becomes detrimental. However, in the midst of such concerns it will become clear that pulling the brake on technology is inhibited by a lack of international cooperation. Finally, the piece goes on to explore the topic of freedom and how we can be constrained physically, psychologically or emotionally with no obvious means of escaping the systems that control us. It also attempts to counter the recent notion of division being conducive to harmony, though this is an easy way to manufacture pseudo-unity as we have recently witnessed in the socio-political sphere.